I’ve had a lot of patients throughout the years with knee pain (I know, earth shattering beginning to a blog post). The biggest thing that we do as Physical Therapists is figure out what is the cause of your pain. I feel like I’ve had a group of patients recently, that have knee pain and their MRI shows they have a meniscus tear…and arthritis. The problem with having both is it makes it hard to discern where the pain is coming from because they are so closely related. The other problem with having both is that surgeons are usually shy about performing a meniscectomy (remove the torn meniscus) because it may not relieve your pain symptoms. That being said, let’s talk about the differences between the two so you can make an educated decision if this is what you are dealing with. 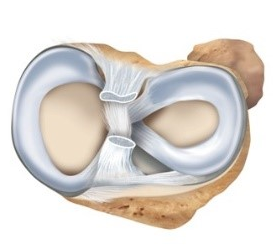 The meniscus is the shock absorber of your knee. You have one on the inside (medial) and outside (lateral) of your knee. If you were looking down from the top of your knee they look like two lima beans. If you look at them from a straight on view they look like a race car track meaning the peripheral portions are thicker and it slopes down towards the middle of the knee from there. Typically a torn meniscus will hurt right over the joint line and will be sore at end ranges of knee movement. It will also usually hurt with activity, especially loading and twisting. Remember, its your shock absorber, so the more bumps you take the more strain you are putting on it. Think of it like driving a car. If you go over a lot of bumps you will feel it more. When you have a torn meniscus the surgeon will usually just cut out the torn portion, which is usually on the inner portion. That way they can take the torn tissue, while still leaving a lot of meniscus for you to play with. Recovery is usually quick (if you have a good PT) and you are usually back to your normal activities in a couple months time. Arthritis is a loss of cartilage. Cartilage is like the shiny end of a chicken bone. When cartilage slides on cartilage, no problem, when it starts to wear down is when bone gets exposed and can lead to inflammation and pain. Arthritis is usually worse in the morning and at night. 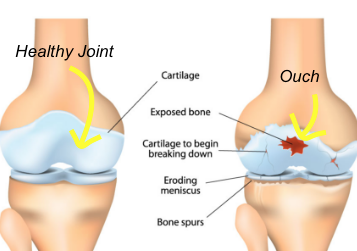 During the day, if you keep your knee moving without much impact, it usually makes the joint feel better. Activities like biking, swimming, non-impact weight lifting are good. Arthritic pain is usually more global, meaning it’s hard to pinpoint with your finger. Sometimes it hurts in one area. The next day it could hurt in a completely different area. It depends on how much arthritis you have and what types of activities you are doing. The surgical solution for arthritis is a knee replacement which isn’t as easy to recover from as a meniscectomy obviously. Recovery from a knee replacement is 3-6 months (back to activity with some pain) with full recovery usually by a year. So what do you do if you go see a doctor only to find out that you have a meniscus tear AND knee arthritis? The best thing to do is start to write down where you have pain in your knee and when. If you start to see that it is more over the joint line, and more with jumping/twisting activities, it’s probably coming from your meniscus. If you find that it is more painful in the morning, but gets better as the day goes along, and not in a consistent spot, it’s probably arthritis. I would always recommend trying a course of PT first. In both cases there have been plenty of studies that show that PT can be effective without requiring surgical intervention. If PT doesn’t help and it appears to be more meniscus, if it were my knee, I would have the surgery. If PT doesn’t help and it appears to be more arthritis, it depends on what I would recommend. A knee replacement is a much bigger surgery, but is also really effective for relieving knee pain. It is really age related but I will say this … most patients that I have, that have had knee replacement surgery, say they wish they had done it sooner. I hope this helps to give you an idea of why your knee hurts and what you can do about it. If you have any questions please comment below. If you would like to schedule an evaluation to see what might be causing your knee pain, please contact us at OrthoCore Physical Therapy 401-667-0131 to make an appointment at our Westerly or North Kingstown locations.